Pam’s Pictorama Photo Post: Happy first snow in Manhattan! I’ve been saving this one for you! Another area I have trailed off into a bit is photos of cats in snow. Those of us who have lived with cats in the suburbs or country know that they have mixed feelings about the stuff, at best. On one hand, they love to watch it fall! For apartment cats this is pretty much where it starts and ends – although I used to bring snowballs into the bathtub for my cat Otto who enjoyed them immensely. The world as a snow dome. Few things are funnier than watching a cat try to negotiate outside in the snow – especially deep snow. They can walk on it for a second before breaking through – which eventually leads to hopping until they get to a secure dry spot. It is worth noting that none of the cats pictured are actually touching any of that cold wet stuff. The cyanotype is the photo I have owned the longest and, I assume, the oldest of the bunch. Like many other things I have shared, it lives in my office where I see it everyday. It is backed on a bit of cardboard so I am unsure if it has anything on the back. I believe it came via Canada. It takes a moment and then you realize that it is a photograph of a good size cat clinging onto the front of a very large man. Ouch! Good thing he has layers on. Probably turn-of-the-century, but the farm probably already looked that way for fifty years – and perhaps did for fifty more. 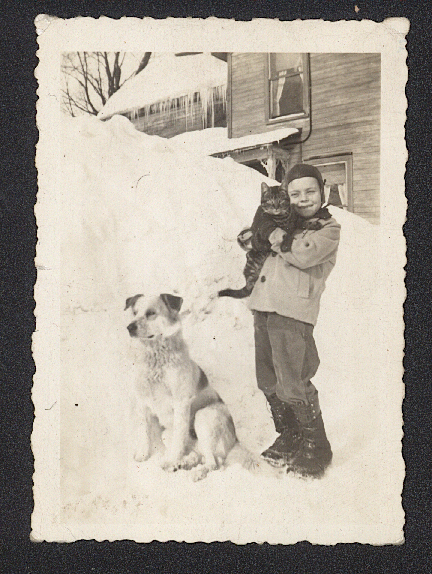 The featured photo is marked December ’49 and I love this kid with his double-fisted cat hold. 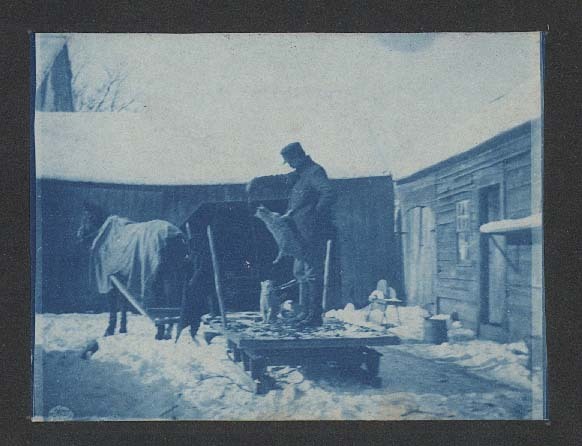 He too is dressed for the snow around him (snow shovel seems to be right behind him) and a good looking barn behind him. Boy, do they have some snow! Look how high it is on the ladder in the back. He’s got two nice looking cats and they look pretty pleased with their perch on his lap. He’s a pretty old guy today – wonder how this photo got away from him. Lastly we have my most recent snow cat purchase. It is marked on the back 1942 John Duke & Honey. Cannot say if Duke is the cat (my vote) and Honey the dog or the other way around. These folks had some serious snow drifts as well, up to the second floor of the house. This kid has his arms around a contented, fat tabby – the dog (dogs really like snow) is guarding them in that proud way dogs do. I don’t know why, but these photos remind me of my own childhood – which had what probably amounts to an average amount of snow. Still, no one can resist the thrill of a snow day.